I really enjoyed my Thanksgiving holiday break this year. It was a great opportunity to recharge my batteries and get ready for the start of the winter Futsal season. The extra time I had gave me the opportunity to observed SPORTING KC Academy Sessions but on by their Technical Coach. The quality of the players is obviously very high but what struck me most was the attention to detail from the coaching staff and the high expectations they held the players to. It’s easy to set up the activities and environments they create but that’s pointless without the focus and precision they demand of the players. My teams are back to training this week in preparation for start of our Futsal season this weekend. I’ve been focused on individual ball control and possession with my youngest team and more on structure and patterns of play with the older ones. There are times I’ll do the same things with all of my teams but ask more of the older players. This season I looked closely at what each group needed and tailored the session to them. Today’s question comes from David. 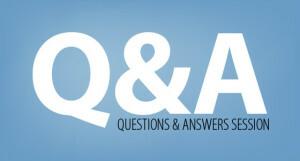 His question is about identifying 2 v 1 situations. I would start by playing 2 v 1 with the attacking players trying to finish into a small goal. This gives you the opportunity to coach all of the important concepts of this situation (ie. dribble at the defender, angle of second attacker, movement options, etc). Then I’d change to 3 v 2 and show the players how they can create a 2 v 1 by taking the ball at one of the defenders with the support of the second attacker. Continue to build up and finish with an even-sided game and see if the players are able to find the 2 v 1’s. If you see it, call it out, “That’s a 2 v 1.”, until the players start to see them on their own. As I’ve discussed before, the teams in our club play Futsal during the winter months. If you’re not familiar with Futsal, it’s a 5-a-side game with four field players and a goalkeeper. 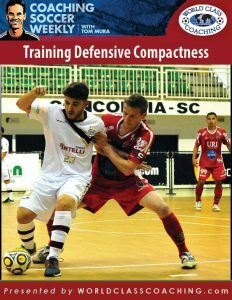 Very effective Futsal teams are able to stay very compact defensively. The session I’ll share today gives you the opportunity to coach all of the keys to playing a tight, compact defense that will be very difficult to score against. I really appreciate everyone who subscribes to the podcast, has written a review on iTunes, sent me a question by email or posted our links on social media. If you enjoy this podcast would like to contribute to its continued growth; I’d ask you to do one or all of these things this week. You’d be helping me spread the word about the show. Next week I’ll share some of the activities I’m using to train the players to attack effectively in Futsal. ‘Creating 2v1 attacking situations’ first quoted by the great Helmut Schon the West Germany head coach in three world cups 1966-1974.